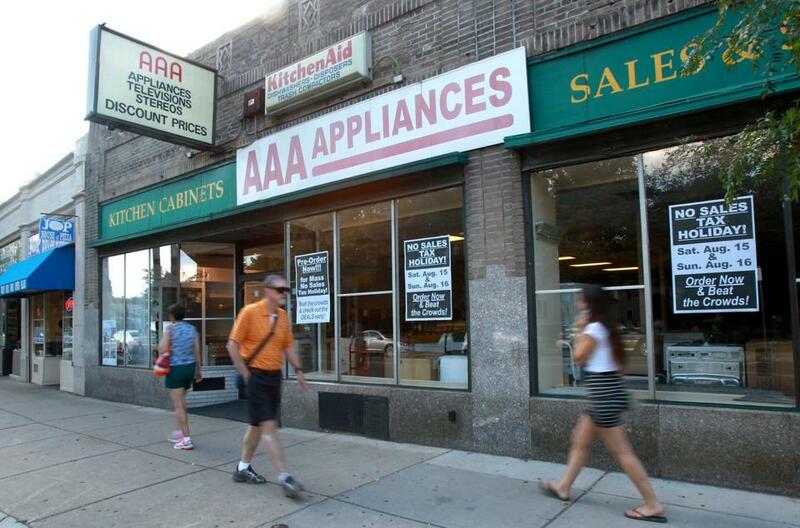 AAA Appliances in Jamaica Plain prepared for the sales tax holiday in August 2015. THE SALES TAX disparity between in-store and online retailers is one of the worst aspects of our tax code. It creates an uneven playing field for brick-and-mortar stores, who lose millions in sales to out-of-state competitors, and it costs the state jobs and tax revenue. Local sellers applauded Governor Baker’s recent announcement that the state will seek to require out-of-state Internet sellers to start collecting sales tax. The big Internet sellers, desperate to preserve their pricing advantage, will challenge this in court — which may take years to resolve. In the meantime, the state can help Main Street businesses keep jobs and tax revenue in the Commonwealth by restoring the annual sales tax holiday. Since 2004, Beacon Hill has authorized 11 sales tax holidays — two-day events held in August — and they have been successful every year. These holidays give local stores a fighting chance to capture out-of-state sales and retain customers. Tax holidays also allow elected leaders to send an important message to our residents: that it’s in our economic interest to spend important discretionary dollars locally. But whether it’s penny-wise or pound-foolish, or a general lack of concern for low-income consumers and the future of local retailers, Beacon Hill took a pass on the holiday last year. 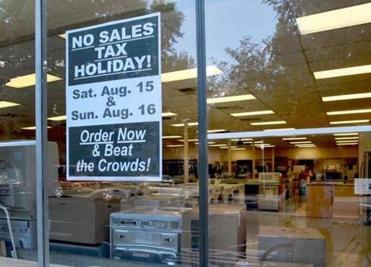 State legislators need to put the annual August weekend sales tax holiday back on the shelf. Policy makers need to take action to protect our Main Streets and reduce the negative impact of the sales tax on retailers and consumers. A two-day sales tax holiday is the least Beacon Hill can do to throw a life preserver to local employers who are disadvantaged 365 days a year. Failure to obtain tax fairness for all sellers and consumers will certainly lead to a serious debate on whether the tax is even viable in the 21st century. Good tax policy creates incentives for local spending and investment. For five decades, the Massachusetts sales tax has unfortunately shifted billions of consumer dollars out of the Commonwealth each year — first to New Hampshire, and now to online sellers. Any Massachusetts consumer with a car can go to New Hampshire to avoid the 6.25 percent tax, and anyone with a smartphone and a credit card can avoid it altogether without ever leaving home. And too many do, taking tens of billions out of the state’s economy each year. A tax that falls disproportionately on the shoulders of lower-income families is an important part of this story. So is the effect on our shopping districts, proliferating dark store fronts, leading to fewer jobs, less commercial property tax and income tax, and — ironically — less sales tax collection. The enemy here is not online retail; it is an unfair and antiquated tax code that’s killing jobs and turning our Main Streets dark. Beacon Hill should recognize this. Declaring our 12th sales tax holiday this August would be a good start. Jon Hurst is president of the Retailers Association of Massachusetts.